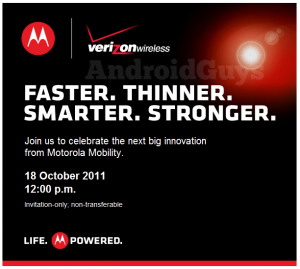 Faster, Thinner, Smarter, Stronger: Droid Razr Announcement Next Week? Motorola and Verizon have sent out invitations to a press event scheduled for October 18th where they promise we’ll see the next big innovation out of Motorola Mobility. 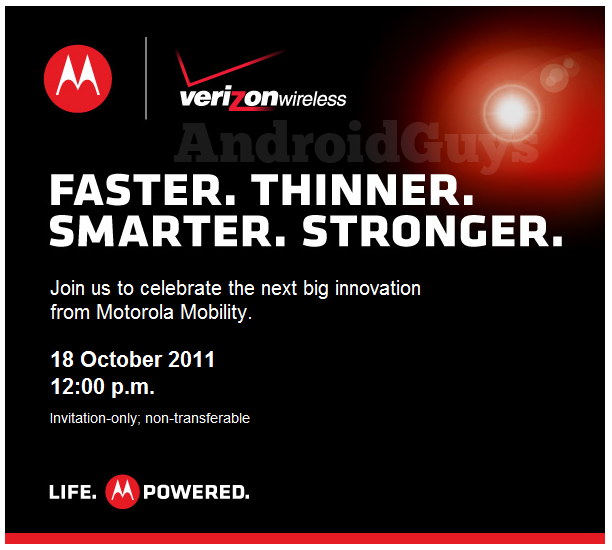 Teased as “Faster, Thinner, Smarter, Stronger” we’re gonna go ahead and forecast this as the debut of the Droid Razr. Expected to blend the two iconic brands in one device, rumors have this one offering 4G LTE service and featuring a 4.3″ 960×540 qHD Super AMOLED, a 1.2GHz dual-core CPU, 1GB of RAM and an 8MP camera. We’ve been expecting news on this handset since late May when it was first leaked on a redesigned Motorola website.